New Delhi: Even as he faces criticism for underestimating government spending in the Union budget for the next fiscal year, finance minister Pranab Mukherjee on Friday increased expenditure on programmes such as the Member of Parliament Local Area Development Scheme (MPLADS) and hinted at a rollback of some of the tax levies he had announced in the budget. 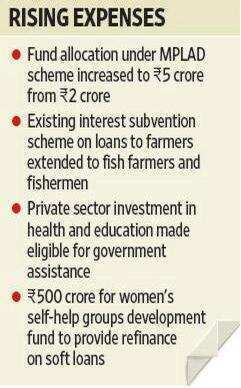 The Congress-led United Progressive Alliance (UPA) also announced incentives for investments in health and education sectors, and announced concessions for fishermen, who constitute a large electoral support base in the three states and a Union territory that are set to elect new governments in April-May. Mukherjee, while replying to a debate on the Union budget in the Lok Sabha, said that the financial assistance provided for members of Parliament (MPs) belonging to both the Rajya Sabha and the Lok Sabha—250 and 545, respectively—for their constituency developmental works has been raised to ₹ 5 crore from ₹ 2 crore. The finance minister said this would result in additional allocation of ₹ 2,370 crore a year. From a governance point of view, increasing the MPLAD fund is not a very desirable thing, said M. Govinda Rao, director at the National Institute of Public Finance and Policy. “The Centre will add more such measures as the year passes on and hence it will be difficult to manage these accumulated additional expenditure," said Rao. “They have to raise much more revenue to support any increase in expenditure." Mukherjee also extended the existing interest subvention scheme of providing short-term loans to farmers at 7% interest with additional interest subvention for timely repayment to fish farmers and fishermen as well. Subvention is a subsidy provided by the government on the prevailing interest rates charged by banks. He said capital investment in healthcare and educational institutes will be treated as a sub sector of infrastructure and will qualify for the government’s financial assistance support through viability-gap funding. The viability-gap programme provides financial support to infrastructure projects undertaken through public-private partnerships to make them commercially viable. With the code of conduct being effective since 1 March when the Election Commission announced assembly elections for Assam, West Bengal, Tamil Nadu, Kerala and Puducherry, Mukherjee said the government had obtained the approval of the poll panel. But MPs from the poll-bound states will not be able to utilize the enhanced allocation or make commitments against this enhanced allocation till the entire election process is over, he said. The new announcements may further weaken the fiscal consolidation process, according to economists, who were sceptical about the amount of subsidy provided in the budget for the year starting 1 April because of rising prices of crude oil and food, especially in the wake of political unrest in West Asia and North Africa. The budget has allocated only ₹ 23,640 crore as fuel subsidy compared with ₹ 38,386 crore in the current year. However, Sonalde Desai, senior fellow at the National Council of Applied Economic Research, welcomed the announcement on the health and education sectors, saying there seems to be a realization of the importance of private sector in health and education. “I don’t think this will lead to reduction in government expenditure in the social sectors. Government is suggesting different modalities that should be encouraged in health and education sectors," she said. Hinting that there could be a review of some tax proposals, Mukherjee said: “Since the presentation of the Budget 2011-12, I have received several suggestions and representations, including valuable feedback from members, on taxation proposals. These are under examination." Mukherjee said he will refer to these issues in his reply to a debate on the Finance Bill 2011. There have been demands that the government should roll back the 5% service tax on centrally air-conditioned private hospitals with 25 beds or more and diagnostic services provided by them. The minister said the extension of the interest subvention scheme to fishermen will benefit two million fish farmers and fishermen. Among the poll-bound states, Kerala, Tamil Nadu, West Bengal and Puducherry have a considerable fishermen population. In his budget for the current fiscal, Mukherjee has allocated ₹ 4,888 crore for the existing programmes for farmers to provide short-term loans at 7% interest rate. In his more than hour-long speech, Mukherjee told the opposition members not to indulge in rhetoric. “The point is, how to deal with the black money? It is a serious issue. We shall have to first go with the legal framework, and we have done it." The UPA government has been under fire from the opposition, which blamed it for its failure in bringing back the black money, allegedly stashed in foreign banks. On containing inflation, Mukherjee said fighting unacceptably high inflation is the most important issue that needs to be addressed. The finance minister was also confident that the high oil prices and soaring food prices at the international level would not affect India’s growth, which the government claims will be at 9% in 2011-12. “We can and we shall (achieve 9% gross domestic product growth)," he said.